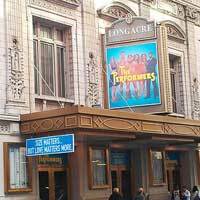 History The Longacre, named for Longacre Square (now Times Square), was built by producer/manager H.H. Frazee (also known as the owner of the Boston Red Sox who sold Babe Ruth to the Yankees). After Frazee fell into financial difficulties, the theatre changed hands many times before being sold to Astor Theatre Incorporated, a Shubert subsidiary, in 1919. WOR leased it from 1943-1953 as a radio and television playhouse. Architecture Henry B. Herts designed the Longacre, one of four currently operating Shubert playhouses that he designed. It boasts a French Neo-classical-style exterior and a Beaux Arts-style interior, but lacks some of the individuality and flair which characterized Herts� other designs. In 2007-08, architect Michael Kostow oversaw a multimillion dollar restoration of the theatre, restoring the original plasterwork and architectural detail, expanding patron amenities, improving sightlines and repairing and cleaning the neo-French Classical exterior facade.